Thick wall of HDPE UV Protected plastic. Quick and easy conversion from protein to automatic timer. 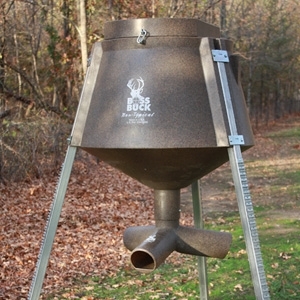 Hopper weight 30lbs. All galvanized hardware. Lid designed with loose fit to allow proper ventilation. 3-Way system has 10" ports with 4" I.D. openings for a deer's muzzle. Approximately holds: 350# Corn / 300# Large Protein Pellets. Converts to Hanging Feeder.